Funko Specialty Series: Popeye Pop! & Krypto the Superdog Pop! Every store deserves an amazing Funko exclusive! In an effort to recognize their most special accounts and loyal retailers, Funko is continuing their Specialty Series. Every month, they announce two major exclusives – this month includes two Pop! The latest exclusives are a Popeye Pop! and Krypto the Superdog Pop! Both are on sale this May! Holy hang ten, Batman! These DC Pop! figures are ready for the beach! 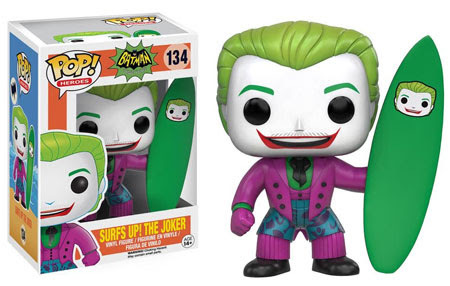 Funko‘s latest Batman and Joker Pop!s were inspired by the iconic “Surf’s Up, Joker’s Under” episode of the 1960s Batman TV series! Keep the Joker from ruling the waves this summer! Pop! Heroes: DC are out in July from Funko. Pop! Heroes: DC in May! Funko is proud to introduce the latest Pop! figures from DC Comics! The newest installment includes powerful heroes like Firestorm, Supergirl, Power Girl, and Cyborg! It’ll take the whole team to bring down supervillian Black Manta! Pop! Heroes: DC are out from Funko in May.